The ME-W1 Wireless Microphone is a compact wireless Bluetooth microphone system that allows you to capture clear audio from subjects up to 164 feet away. The ME-W1 Wireless Microphone is compatible with the ME-1 Stereo Microphone for wireless stereo audio and music recording. 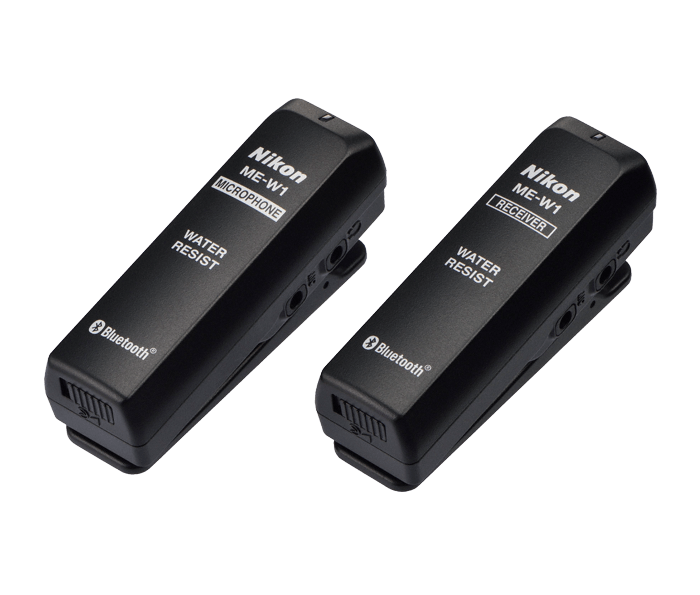 The ME-W1 Wireless Microphone is compatible with all Nikon cameras that feature a 3.5mm microphone jack. When recording voice/music, use the optional ME-1 Stereo Microphone to record audio in stereo. Simply connect the ME-W1 wireless monaural microphone to the ME-1 to record stereo sound. The ME-W1 Wireless Microphone is powered by a AAA Alkaline or AAA Ni-MH rechargeable battery, which provides approx. 3 hours of continuous use. The ME-W1 lets you record sounds from both the microphone and receiver, delivering a mix of the photographer and subject’s voices. You can also connect third-party headphones or earphones to each unit to allow conversation between the photographer and subject in between shooting.